Modelled on the Malaria Box, the Pathogen Box contains 400 diverse, drug-like molecules active against neglected diseases of interest and is available free of charge. The Pathogen Box compounds are supplied in 96-well plates, containing 10​μL of a 10mM dimethyl sulfoxide (DMSO) solution of each compound. Upon request, researchers around the world will receive a Pathogen Box of molecules to help catalyse neglected disease drug discovery. In return, researchers are asked to share any data generated in the public domain within 2 years, creating an open and collaborative forum for neglected diseases drug research. Neglected tropical diseases (NTDs) are a diverse group of infectious diseases found largely in tropical and subtropical countries which affect more than one billion people, costing developing economies billions of dollars every year. They mainly affect populations living in poverty and in close contact with infectious vectors, domestic animals and livestock. 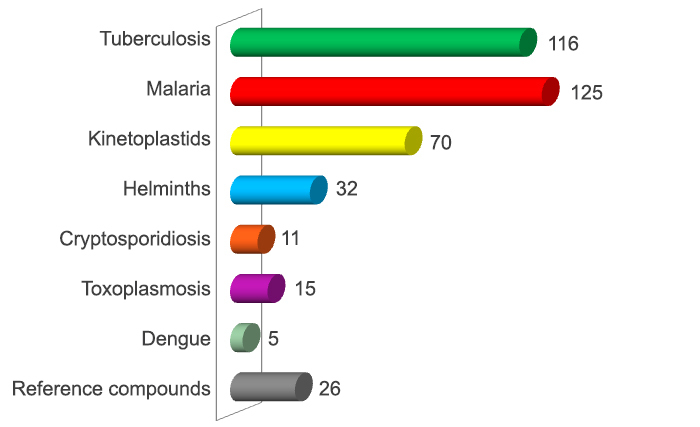 The Pathogen Box composition (number of compounds) is illustrated below. View the plate mapping of the 400 compounds included in the Pathogen Box. View the biological data and DMPK data with chemical structures as smiles or with illustrations of the structures.